Halloween is just around the corner. And due to that, NetEnt Company has created a game, that is not for the faint of heart – “Halloween Jack” online slot. The game is about one of the most mystirious and the darkest fest of the year, also is known as All Saint’s Eve or Halloween. People make masquerades and wear different scary and unusual costumes. And of course Halloween can be without pumpkin lanterns or so-called Jack-o’-lantern. 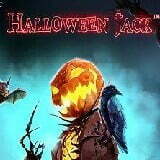 “Halloween Jack” online slot has all the atributes of the real Halloween. Games’ background is made in dark colors, and playing field has 5 reels, 3 rows and 20 active lines. The following symbols are depicted on the screen – horseshoe, raven, bat, horse, as well as female vampire.Also there are low symbols starting with the usual 10s to As suits. Game has Wild and Scatter symbols too. Wild – is a curved pumpkin. Wild can substitude other symbols, except the Scateer. Scatter – is a chest and this symbol starts Free Spins mode. Online machine has the following features: Walking Wild Re-Spins with Win Multiplier, and Jack’O’Lector Free Spins Feature. Walking Wild Re-Spins with Win Multiplier. When the Wild symbol drops on the reels, a re-spin starts, during which Wild moves from right to left, multiplying all winnings in which it participates by 3. If at this time another symbol Wild appears on the reels, then repeated spins continue. This happens until all Wild symbols disappear from the reels. Jack’O’Lector Free Spins Feature. When 3, 4 or 5 characters of the Chest roll out, the bonus game consisting of 10 initial free spins is launched. On the 5th reel special Lanter symbols may appear. These symbols that are accumulated. When there will be 3 Lanterns, the Hell Hound Wild will start. Stacked Hell Hound Wild can occupy from 1st to 2 vertical drum cells and repeats the function of the usual Wild symbol – moves from right to left and multiplies all winnings by 3. Stacked Jack-o’-Lantern Wild may fall out after six Lanter characters have been collected. And can occupy from 1st to 2 vertical drum cells and repeats the function of the usual Wild symbol – moves from right to left and multiplies all winnings by 3. 9 collected Lanterns start Expanding Death Reaper Wild and will fill the full drum and also repeats the function of the usual Wild symbol. So trick or treat? What do you prefer? Game is very atmospheric and good organized. Halloween Jack has interesting gameplay and bonus features. Don’t be afraid and win.